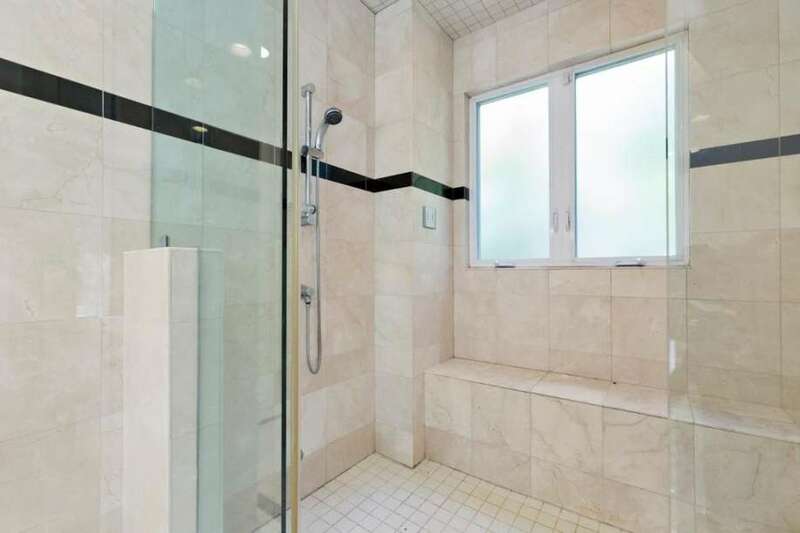 A beautiful glass-enclosed shower can be the focal point of any master bathroom. By incorporating unique bathroom tile ideas you can create a piece of art that sets the tone for the rest of the space. 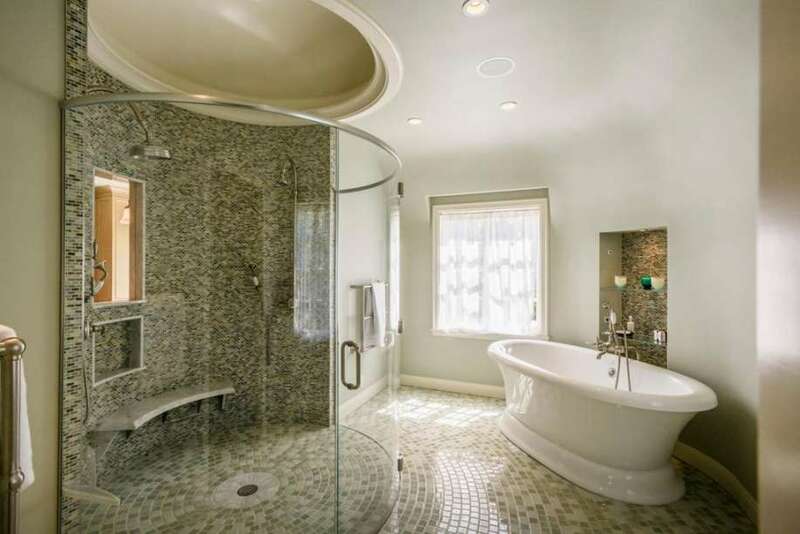 This designer used amazing mosaic tiles in a neutral grey color palette to build a gorgeous oval shower enclosure complete with bench and traditional paneled ceiling. 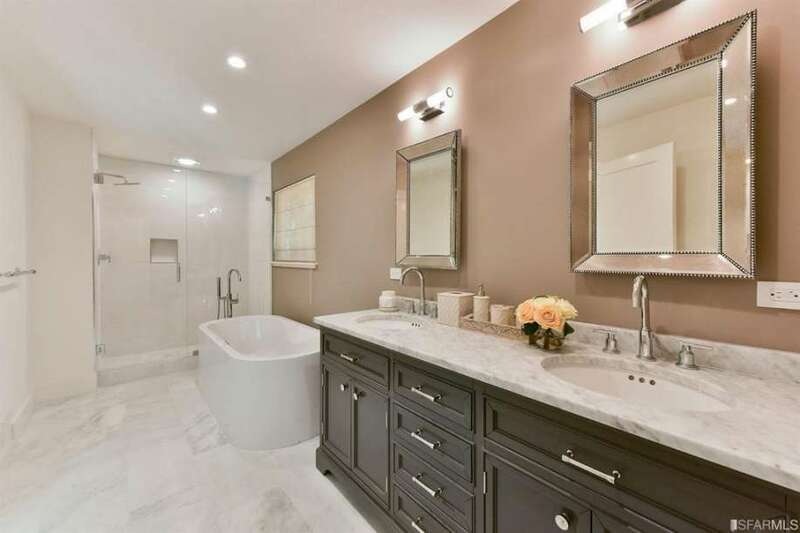 They then completed the look by incorporating the same shower tiles throughout the rest of the space in the flooring choice with fun shelving units next to the soaking tub. This is a great example of how something as simple as shower tiles can really set the tone for a room. There are a wide variety of bathroom floor tiles available online and in stores, so learning what type will best suit your both your design style and needs is an important first step in redecorating this space. For example, sleek and colorful glass tiles look beautiful in modern bathroom designs but if this material is not installed properly, or the right texture, then it is not as durable and much more slippery than other materials. 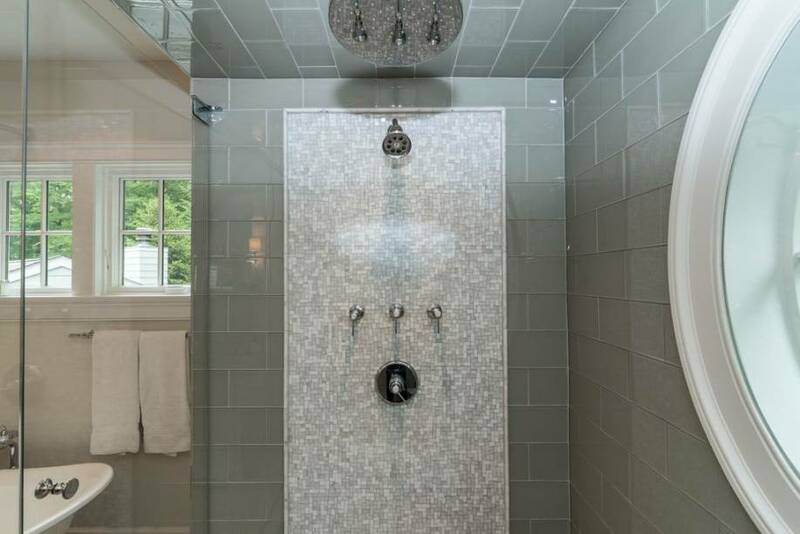 However, glass can be the perfect choice for bathroom wall tiles because this part of the room does not receive as much traffic and therefore does not require quite as much durability. As a do-it-yourself homeowner looking for bathroom tile ideas, such as repainting the walls, installing new fixtures, or even laying new tile, you are probably trying to stay within a certain budget. It is important to shop around to see if you can find fixtures, paint, and tiles for sale prices. When it comes to selecting options for your shower tile ideas, certain materials tend to be less expensive than others. Although very similar in style and constituents, ceramic tends to be much cheaper than porcelain. Similarly, travertine stone or marble tends to be more expensive than porcelain, but vary in durability, maintenance, and size. When redesigning your bathroom, one of the most important steps you can take is choosing the right type of tile. The most popular bathroom tile ideas use material in a bathroom because of its use in the shower, as flooring, and even as decoration on walls. Therefore, choosing the right bathroom flooring and wall tiles can mean the difference between designing an ordinary space, and creating a stylish room that will leave friends and family envious! With the wide variety of ceramic tile patterns, materials, sizes, and shapes available on the market, the task of finding the perfect one for your home can be a little daunting. So many homeowners tell me that they are nervous to pick new shower tile because there are countless options available to choose from. Admittedly, bathroom tile ideas are a huge part of determining the look of a space and can certainly set the tone for your new bathroom. For this bathroom we used the homeowners artwork as a starting point to select these large neutral bathroom wall tiles with pops of black granite accents. Selecting the right material and color scheme for your space does not need to be challenging. The first steps are finding inspiration and setting your budget. Find an inspirational picture that incorporates bathroom tile ideas that you love or select a piece of artwork that has a color palette that you want to bring into the space. 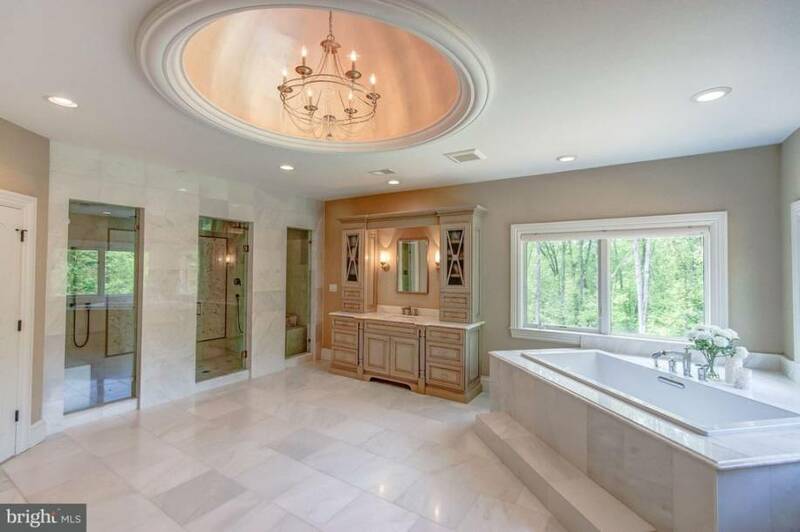 Many homeowners are scared of bathroom remodels because there are far more major design decisions to make than in a living room or bedroom. The most important item to select is floor tiles because they instantly update the look of a room and determine the decor style. When looking through bathroom tile ideas that you may want to use in your home, it is important to identify the material and color palette that would best suit the space. We decided to replace old outdated porcelain tile with these beautiful marble floors. 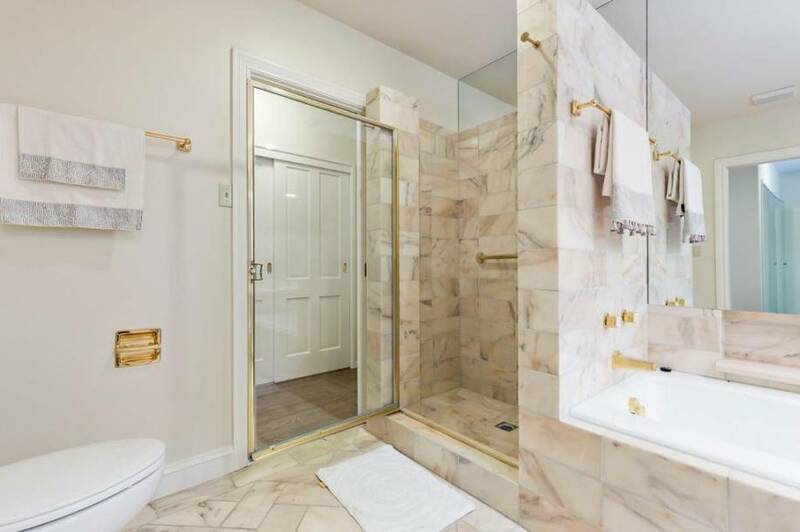 This made the rest of our design decisions simple, because we then carried the same marble look throughout our countertops and new glass-enclosed shower.